A climbing expedition on Mt. Everest is devastated by a severe snow storm. For a tale of survival based on real events, we check out 2015’s Everest. In spring 1996, multiple expeditions attempt to conquer Mount Everest, as this once-unfathomable feat has essentially become a tourist activity. Rob Hall (Jason Clarke) leads a company called “Adventure Consultants”, while Scott Fischer (Jake Gyllenhaal) takes charge of competitors “Mountain Madness”. Hall and Fischer accompany climbers of varying skill levels as the ascend Everest, and in the interest of efficiency, Rob convinces Scott that the two teams should scale the mountain together. All involved find themselves with a much greater challenge than they expected when a massive blizzard assaults their location. This requires the climbers to resort to extraordinary measures if they intend to survive. Though I suspect those involved want us to view Everest as a serious drama – a deep “man vs. nature” treatise, if you will – in truth, it really adds up to nothing more than a simple disaster movie. At its core, the movie gives us harrowing action and not much more than that. I shouldn’t mind this lack of substance – I never complained when flicks like Towering Inferno presented paper-thin characters – but in this instance, the absence of depth becomes a real hindrance. Most disaster movies aspire to bring us little more than spectacle, but Everest wants to have it both ways. While it desires to provide scenes that excite us, it also wants us to truly care about its characters. For the most part, we don’t, and I can’t help but think the nature of the endeavor itself prompts a lot of that lack of emotion. In most disaster movies, the characters find themselves in harm’s way through no or little fault of their own. That’s not the case with Everest, as all those involved actively put themselves in danger. Sure, as I mentioned earlier, the ascent of Everest had become more commonplace by 1996, but that obviously didn’t make the task devoid of substantial risk, and as seen in the film, stupid choices by some of the characters created even more problems. This means I find it hard to really invest in the characters. It’s like the story of “Grizzly Man”, the guy who thought he could live among the bears. When one of them turned him into a meal, it was tough to feel much sadness. The same goes for those who choose to climb Everest. Of course, I’m sorry that these people died, but to use a cliché, they knew the risks. Perhaps I’d feel more compassion toward the characters if Everest developed them better, but it leaves the personalities one-dimensional – if that. We get to know about Rob as well as climbers Beck (Josh Brolin) and Doug (John Hawkes), but only a little. Outside of some basics, they remain unknown to us – and that goes for their motives. Given that a task such as the ascent of Everest sounds like suicide to many of us, the film needs to explore the rationale involved, and Everest pays lip service to that notion. However, it fails to really explain why Doug, Beck and the others do what they do. We get some trite clichés but little more, so we find it even more difficult to invest in their journeys because we don’t understand them. When it comes to the “action scenes”, Everest does muster some good material. It places the viewer smack-dab in the middle of the situations and can offer some dramatic sequences. The filmmakers execute these in a convincing way, so we feel as though we’re in the thick of things. Unfortunately, the lack of emotional impact means that these scenes never live up to their potential. If we cared more about the characters, Everest could be come a powerful survival tale, but absent any real investment in the roles, it remains curiously devoid of power. 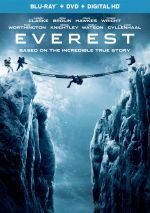 Everest appears in an aspect ratio of approximately 2.40:1 on this Blu-ray Disc. This became a strong visual presentation. Sharpness always excelled. From start to finish, the movie offered fine definition, with good clarity and accuracy. I saw no shimmering or jaggies, and the image also lacked edge haloes. Of course, print flaws remained absent. Don’t expect anything out of the ordinary from the film’s palette, as it emphasized teal like so many other movies these days. Some amber also popped up, but the bluish tint dominated. That was uncreative but the hues seemed well-rendered. Blacks also came across well. Dark tones appeared deep and rich, and low-light shots brought us smooth, clear imagery. Really, I could find nothing about which to complain, as this became a consistently stellar presentation. In addition, the Dolby Atmos soundtrack of Everest worked very well. Downconverted to Dolby TrueHD 7.1, the mix offered a terrific auditory experience. Of course, the activity levels mostly came to life during the storm sequences, and the soundfield did become quite immersive on those occasions. Since much of the movie depicted intense weather, that meant a lot of wind and snow whipping around us. The track used the channels to good advantage and created an involving soundscape. Audio was solid. Speech appeared intelligible and concise, without edginess or other problems. Music occasionally threatened to become lost in the mix, but the score was usually fine; I didn’t discern any significant problems with that side of things. Effects were the highlight, and they delivered a good impact. I thought those elements demonstrated nice clarity and range, with solid low-end response. The movie offered a consistently dynamic and involving mix. The disc provides an audio commentary with director Baltasar Kormákur. He delivers a running, screen-specific look at story/character areas and research, attempts at realism vs. creative license, cast and performances, sets and locations, effects and stunts, and related topics. For the most part, Kormákur brings us a good commentary. He focuses largely on issues related to the facts of the story, but he broadens his horizons well. This never turns into a great chat, but it remains engaging and informative. Four featurettes follow. Race to the Summit lasts 10 minutes, 59 seconds and presents comments from Kormákur, producers Nicky Kentish Barnes and Tim Bevan, co-producer David Breashears, advisor/head of mountain safety Guy Cotter, and actors Jason Clarke, Josh Brolin, John Hawkes, Jake Gyllenhaal, Michael Kelly, Martin Henderson and Naoko Mori. “Race” looks at the root story, logistics of the shoot, and the director’s impact on the production. A few good shots from the set emerge, but the content tends to lean toward grand statements about how tough the shoot was. During the four-minute, 42-second Learning to Climb, we hear from Kormákur, Brolin, Clarke, Barnes, Gyllenhaal, Kelly, Bevan, Hawkes, Cotter, Breashears, Henderson, and actor Vanessa Kirby. “Climb” examines the actors’ training for their experiences. This becomes moderately informative but often fluffy show. A Mountain of Work goes for five minutes, 13 seconds and features Kormákur, Breashears, Barnes, Brolin, Mori, Bevan, visual effects supervisor Dadi Einarsson and production designer Gary Freeman. “Work” discusses sets and effects used to recreate Everest settings. Like its predecessors, “Work” gives us a decent but self-aggrandizing overview. Finally, Aspiring to Authenticity fills six minutes, 47 seconds with info from Kormákur, Breashears, Clarke, and real-life participants Jan Arnold, Helen Wilton, Beck Weathers and Sarah Arnold-Hall. The program offers some perspectives from those who were actually involved in the movie’s events. “Authenticity” is too brief but I like the glimpse of the actual people. The disc opens with ads for Steve Jobs, Crimson Peak, Jarhead 3: The Siege, Woodlawn, London Has Fallen and Straight Outta Compton. No trailer for Everest appears here. 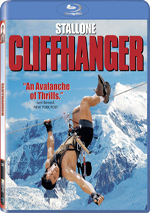 A third disc offers a DVD copy of Everest. It features the commentary as well as “Summit” and “Authenticity”. Outside of some harrowing disaster scenes, Everest doesn’t make much of an impact. It lacks depth and suffers from characters who never give us much reason to invest in them. The Blu-ray provides excellent picture and audio as well as a decent collection of bonus materials. Everest offers moderate entertainment but fails to boast much emotional punch.